Weâ€™re excited to announce that Depth of Extinction is now available on Steam, GOG and itch.io! Itâ€™s been a long road to get to this point and we are excited to see what everyone thinks of the â€œfinalâ€� version of the game. Of course, many of you on itch have played the game previously, but at various stages of development. Build 46 and 47 have mostly been about bug fixes and making performance improvements to the game, but we did manage to add in a few new things that i think have added some value to the game! First, the gameâ€™s final boss has been significantly updated. I donâ€™t want to give away too much, but you better have a powerful team by the time you get to the Android citadel! Weâ€™ve also made some tweaks to the other Android enemies, including giving the Mech (who you see in the opening) the Return Fire ability. Weâ€™ve also added new Plasma weapon objectives into the mix starting in the Meltdown Zone. For these objectives, you first spot a â€œmysterious signalâ€� that you need to investigate. Finding the source will lead you to the location of a powerful experimental weapon left here by the creators. Most likely, you wonâ€™t be the first to have run across it so be prepared for a fight. 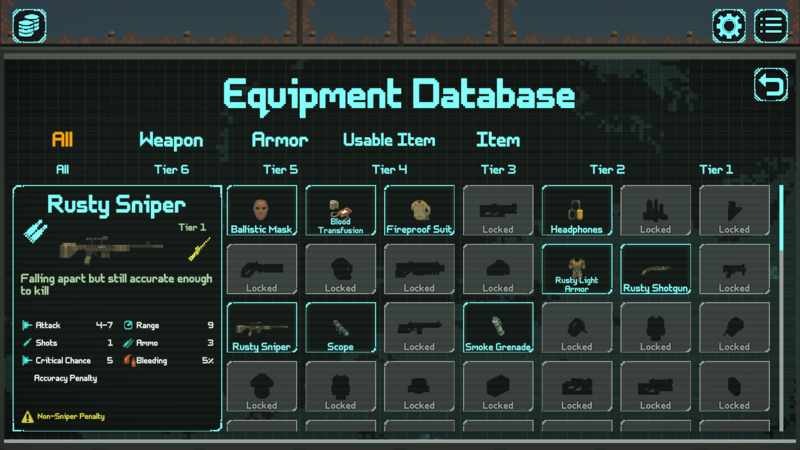 Another new element is the Equipment Database which is used to track item unlock progress in the game. You can see whatâ€™s left by item type and tier. 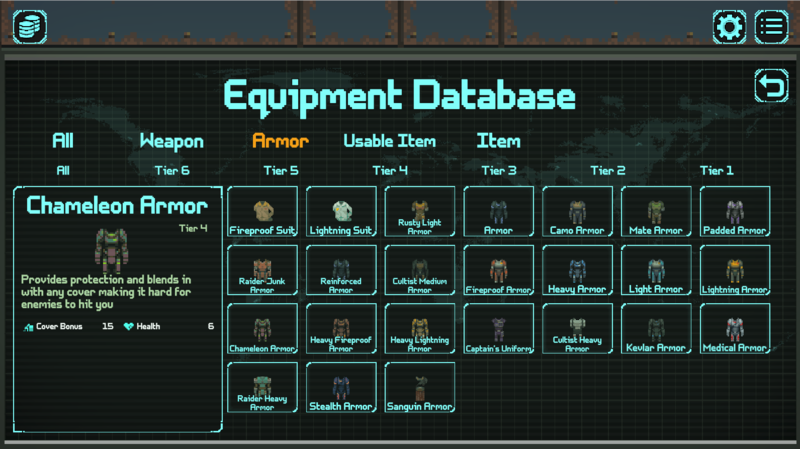 More armors have been added to the game, and a new feature to make them influence health points directly rather than through the Constitution and Grit stats. The coolest new armors are the â€œcamoâ€� types that increase your cover utilization and actually add to the coverâ€™s effectiveness. The top option is the Chameleon Armor. The Warden now has Grenade Launchers as one of his default weapons, so he can use it without the reload penalty. Ambient noise has been added to the tactical missions. If you are outdoors, we get some waves or rain. Indoors weâ€™ve got some mechanical noises or metal groans. Updated the enemy spotted animations to always happen when a new enemy comes into view. Previously these only happened once per pod of enemies, even if only 1-2 of them were initially revealed. Weâ€™re still planning to tweak this a little more based on player feedback. Weâ€˜ve added many more context tutorials in the game UI that will alert you when some new situation arises and provide some advice. Watching the first few Letâ€™s Plays was instrumental in helping us see a few friction points and try to address them.